We've already seen the effects of the Pens' star-studded roster in their bottom six forwards, where GMRS has found several veteran but inexpensive players to fill the ham-n-egger roles. Include the plethora of injuries the Penguins have gone through this season, and they've had a virtual turnstile between Pittsburgh and Wilkes-Barre. Not surprisingly though, the results haven't very good offensively, but I suppose that's to be expected. But those bottom six decsions have to be much easier compared to what is facing GMRS on defense. It doesn't need to be rehashed, but hey, that's what I'm here for, that the Penguins have gotten bounced out of the playoffs in four straight disappointing seasons. Marc-Andre Fleury has gotten his fair share (some might say more than his fair share) of criticism for his poor performances between the pipes in those series, but to be fair and accurate, you also must attribute some of the blame to porous defenses as well. After the latest playoff flop in last season's Eastern Conference Finals vs. Boston, and letting defensemen such as Mark Eaton and Douglas Murray become Unrestricted Free Agents, Shero brought back Cup-winning defensive defenseman Rob Scuderi from the Kings. Shero also revamped the defense within his coaching staff, hiring noted defense-first coach Jacques Martin in August. The biggest surprise, though, this season on the Penguins' blue line has been the Calder-worthy performance of 19 year-old Finnish sensation Olli Maatta. Maatta has the best Penguins two-way defensive prospect since Kris Letang, if not even farther back if you account for Letang's decision-making lapses. But more on that later. The results thus far have been noteworthy. While the Pens' goals-against have remained pretty much the same since last season from 2.45 to 2.48, you see much fewer blatant defensive lapses resulting in goals than in recent years. Plus, as I thought he would, Fleury is having yet another fantastic regular season. If MAF can finally have another playoff run like he did in '09, the Penguins are legitimate Cup contenders. If he stumbles yet again, it's highly unlikely, in my view anyway. But back to the defense. Like I said, I'm focusing on the defense because it appears obvious for the foreseeable future that GMRS will have to continue the "mucker shuffle" in his bottom six. The Penguins have to two significant impending UFA's on the blue line, veteran Brooks Oprik and the vastly improved Matt Niskanen. Orpik's game hasn't changed over his many years in a Penguins uniform - Physical, and steady if not unremarkable defensively. Orpik is in the last year of his contract earning $3.75 million annually. By the time the puck drops on the 2014-2015 NHL regular season, Orpik will have turned 34. That in itself shouldn't be a show stopper, especially considering the Pens already employ the 35 year-old Scuderi and a soon-to-be 34 year-old Paul Martin. But the problem is two-fold: 1) With an already tight salary cap situation, the new contracts for Letang and Malkin don't kick in until next season, with Letang's cap hit rising from $3.5 to $7.25 million, and Malkin's from $8.7 to $9.5 million. And, 2) Orpik will no doubt be getting some kind of raise from that $3.75 million, especially once he hits free agency. Niskanen, however, is frankly a harder decision for GMRS than Orpik in this schmuck's opinion. Remember in the offseason, when the Pens had severe cap problems, when it was simply assumed that Niskanen was on his way out of town? Hard to imagine where the Penguins would have been without him earlier this season when they had so many injuries, particularly defensively. Right now, Niskanen is relatively cheap at $2.3 million, but his vastly improved play is going to result in a big increase in his next contract. I don't believe that a doubling of his salary is out of the question, at all. There's another pending UFA that I have to mention, and that's Deryk Engelland. Every team seemingly has a "coaches pet", and there's no doubt it's Engelland for HCDB. Not only has Engelland gotten ice time over better defensive D-men such as Robert Bortuzzo, but HCDB has been playing Engelland as a 4th line forward in several games as well. I honestly have no idea why, other than Bylsma wanting to keep his physical presence in the lineup. So having said all that, it wouldn't surprise me in the least to see Engelland getting a new deal, although to me he's pretty easily expendable to keep better assets on the team. And finally, the often-discussed young defenseman Simon Despres will be a Restricted Free Agent this offseason. Now, it's widely believed, both in the Penguins' blogosphere and in the Pens' beat writing communities, that Despres will be dealt away leading up to the trade deadline for help on the wing. How much help? That remains to be seen, but as we all remember, Ryan Whitney fetched Chris Kunitz (and Eric Tangradi), not to mention Alex Goligoski fetched both James Neal and Niskanen. I'd be stunned if GMRS could garner that kind of return for Despres, but I learned a long time ago that you never doubt Ray Shero. So when you have decisions like that to make, also taking into account the several outstanding defensive prospects the Penguins have in their system, what do you do? Do you trade Orpik at the deadline, and sign Niskanen to a long-term deal? Or vice-versa? Or, do you get really creative and shock the hockey world by trading Letang? The Pittsburgh Tribune-Review's Dejan Kovacevic offered up that possibility a few days ago. Boy has that column created some crazy speculations. It's not a crazy idea, though. I actually see the rationale that DK makes. The Penguins, not only on the NHL roster, but throughout their minor league ranks, are woefully thin at the wing. There simply aren't hardly any wingers anywhere near the NHL level right now. Add in the ACL tear to first-line winger Pascal Dupuis, and it makes that problem even worse. A potential trade of pending UFA's like Orpik or Niskanen won't fetch much. Perhaps a decent wing prospect, but probably not NHL-ready, which is where GMRS is looking to strengthen. Perhaps a decent draft pick as well, but that's it. But Letang? A trade of Letang could result in a return of a top-line young winger, not to mention a very high draft pick, at the very least. Do I think it will happen? Doubtful, it would be a stunner, at least right now. But if it did, as I said, I can see the rationale. Letang's trade value will probably never be higher that it is right now. He's playing good hockey, making decent decisions, and importantly, he's under team control now through 2022. 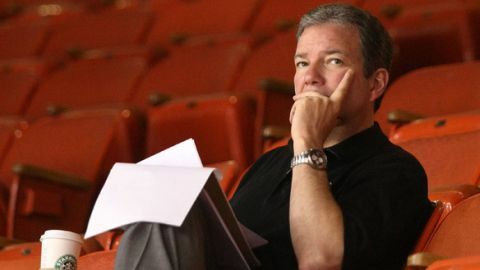 Shero has been known for making deals well in advance of the trade deadline. There may not be time to do that this season, with the ending of the Olympics and the trade deadline being fairly close. Whatever ends up happening, something tells me that the popular Pens' fan phrase "In Shero We Trust" will be uttered yet again. As for Orpik, I say keep him if he’s willing to take a “hometown” discount, but his game has declined a lot. I wouldn’t pay him any more than he’s making now. I’d rather Shero spend that money to keep Niskanen.